The siege and near destruction of the Fox tribe is the earliest known recorded event to take place in what is today McLean County Illinois. The McLean County Museum of History has in its collections and archives many artifacts, records and articles about the siege. The defeat of the Fox is a pivotal event in the settlement of Illinois and the native peoples who lived there. Central Illinois was not always a land of corn and soybeans. Prior to European settlement the land was largely prairie, which gave Illinois its nickname of The Prairie State.The prairie consisted mostly of tall grasses and flowers with small groves of trees along the banks of rivers and streams. According to archaeologists, before Robert de La Salle’s expedition Central Illinois was populated by Native American people know as the Mississippians. The Mississippians were farmers who grew corn, beans, and squash.In addition to agriculture, the Mississippians also extensively hunted and fished. They lived in isolated villages on the edge of prairie lands.The center of the Mississippian culture in the Midwest was the mound city at Cahokia, located in southern Illinois near present day St. Louis. Europeans began to explore Central Illinois in the mid-1600s.European explorers brought with them diseases, such as smallpox and measles that may have killed up to 90% of the Native American population of North America.The Mississippian culture collapsed and in its wake came new tribes into Central Illinois.Among them are the Fox, Sac, Potawatomi, Illini, and Kickapoo. Meanwhile Europeans, mostly the French, continued to build and establish settlements in the Midwest. These include Fort St. Joesph, Fort de Chartes, St. Louis, Cahokia, Detroit, Ft. Miami (Ft. Wayne), and Peoria among several others. The French and other Europeans engaged in trade with numerous native tribes and formed alliances with many as well. The Fox, also known as the Mesquaki (which translates to “People of the Red Earth”), were located throughout Southern Wisconsin, Illinois, Indiana, and Michigan. The Fox were fiercely resistant to the French and their Native American allies. In the 1720s the Fox began a decade long series of skirmishes and raids on the French and tribes allied to the French. The Fox were known as intense warriors who showed little mercy to their enemies. By the late 1720s the French and their native allies were fed up with the Fox’s war making. The Illini were particularly upset with the Fox for having killed a son of their chief.Several Native tribes banded together to attack the Fox, and the Fox began to suffer heavy casualties.The native allies of the Fox began to turn against them and side with the French. By the summer of 1730 the Fox, having suffered several major defeats, felt they could no longer stay in Southern Wisconsin and attempted to flee to the East to join the Iroquois.Approximate 900 Fox men, women and children began the exodus to the east. On their way through Illinois, the Fox’s exodus was blocked by enemy Native Americans (Potawatomies, Kickapoos, Mascoutens, and Illini). The Fox decided to build a defensive fort along what we know today as the Sangamon River.The Fox believed they had ample supplies of food and gunpowder and that the native tribes would not want to engage in a long siege. Over the course of several days the Fox built a fort in the middle of a small grove of trees along the bank of the Sangamon River surrounded by nearly two miles of open prairie.The fort was about 150 feet wide and 350 feet long.There were three walls with the side to the river left open.The walls were made of piled up soil with a wooden palisade on top.Inside the Fox built many houses.These houses were oval shaped, approximately 3 feet wide by 6 feet long, and dug partially into the earth to a depth about between 2-3 feet.The roofs of the houses were then constructed of reed mats and piles of dirt.This acted to make the structures like little bullet proof bunkers. The native allies of the French sent messengers out to Fort St. Joseph near present day Niles, Michigan, which was under the command French captain Nicolas-Antoine Coulon de Villiers.The news reached de Villiers on August 6 and he immediately made preparations to pursue the retreating Fox. In addition, the French commander Lieutenant Robert Groston de St. Ange at Fort de Chartes in southern Illinois also received word of the fighting and prepared a force to fight the Fox.Prior to his departure, de Villiers sent word to de Noyelle at the Miami post (near modern day Ft. Wayne, IN) and Detroit. By August 10 the two French armies were on the move, de Villiers left with 50 French soldiers 300 Sacs, Potawatomies, and Miamis and St. Ange had 100 French soldiers and traders and another 100 native allies.On the way St. Ange would rendezvoused with a group of Illini and then had a combined force of nearly 500 troops. The French and native warriors began a siege of the Fox fort.They surrounded the Fox and attempted to cut off their supplies of water.But without artillery, the Fox were able to hide behind their palisades, earthen embankments, and subterranean bunker-like houses without much harm.In addition, the Fox had dug a series of tunnels and ditches down to the river to maintain access to fresh water.The Fox were able to hold off any advances by the French and their native allies. The Fox felt that they could hold out longer than the combined French and native army. The Fox had completed a large hunt just prior to building their fort which gave them ample supplies of food. The Fox thought the large French and native force would require a lot of food; more than the vast expanse of prairie could provide.In addition, the Fox assumed that the native allies of the French would not have the patience to engage in a long drawn out siege. But as August wore on, the heat and the humidity began to take its toll on the besieged Fox.Their supplies began to dwindle and because of the near constant harassing fire from the French, the Fox were forced to spend most of their time hidden in their hot windowless bunkers.Many of the children and elderly of the Fox began to suffer. Among the French allies were a group of Sac Indians, a closely related tribe to the Fox. The Fox attempted to negotiate a peace with the Sac acting as intermediaries with the French.However, because of the brutality of the Fox’s previous campaigns against the French and other Native tribes, the French commanders said no quarter would be given. On September 1, des Noyelles arrived at the siege from the Miami Post with about 10 French soldiers and 200 Hurons, Potawatomis, and Miami warriors.Des Noyelles brought word from Governor General Beauharnois of Detroit that there was to be no negotiated peace. On the evening of September 8 a large storm began to pelt the area with heavy winds, rain and hail.That night, the storm continued unabated, with the clouds blocking the stars and waning moon, the Fox attempted to use the darkness to flee their fortification.However, the cries of the children alerted the French that the Fox were fleeing.The French commanders de Villiers and St. Ange wanted to pursue the Fox immediately, but the native allies refused to go chasing after the Fox in the dark and through the severe storm. The Fox escape from the fort was chaotic. Many of the tribe’s members got lost in the darkness and chaos of the storm and were separated from the main group.On the morning of September 9 the nearly 1400 person strong combined French and native force set out after the Fox. The pursuers soon caught up with the exhausted and hungry Fox.The Fox quickly formed a skirmish line and engaged in a brief intense, but one-sided battle and the Fox were defeated.Approximately 200 warriors and 300 women and children lay dead at the end of the day.Most of the remaining women, children and elderly were taken prisoners and later sold as slaves.Only about 50 warriors were able to escape without any food or weapons.The defeat marks the end of the Fox as power in Central Illinois. Over time the exact location of the 1730 siege became lost to history and there were multiple claims to the location of the battle.Part of the confusion was due to the inability of the French to record a precise location at the time.The French description of the battle was that it took place on an open prairie between the Wabash and Illinois Rivers, approximately 145 miles south of Lake Michigan and east-southeast of Starved Rock on the Illinois River.The disputes over the early claims to the exact location of the Fort have been well documented by Joseph Peyser, and his articles are held in the archival collection at the Museum.After the siege the French made several maps of the site. A reproduction of the 1731 “Blocus du Fort” map is housed in the Museum’s archives. The exaction location of the fort in McLean County is made all the more confusing due to the fact that there are two Native American forts in the county.One is the 1730 Fox Fort and another from about a century later made by the Kickapoo in the early 1800s. The amateur historians who were looking for the location of the 1730 fort often confused the two locations. The Fox fort has been the subject of several amateur and professional archaeological excavations.The first recorded excavation took place in 1897 at the Smith Farm near Arrowsmith.The Pantagraph article that documents the 1897 excavation is stored in the Museum’s archives.At the time, the breastworks of the fort were still partially visible and had not been completely destroyed by plowing for farming.The artifacts found during the excavation included lead musket balls, iron, and bone fragments.These artifacts are stored in the Museum’s collection. In the 1930s William Brigham was the superintendent of schools for McLean County.He was an amateur historian and archaeologist.He wrote about and studied many events in McLean County’s history. One of his projects included searching through the historic records of the Fox siege.He came to the conclusion, that the site located near Arrowsmith was the only possible location of the 1730 siege.He began to give lectures and wrote several publications about his conclusions.His substantial notes and collections are housed in the archives of the Museum. 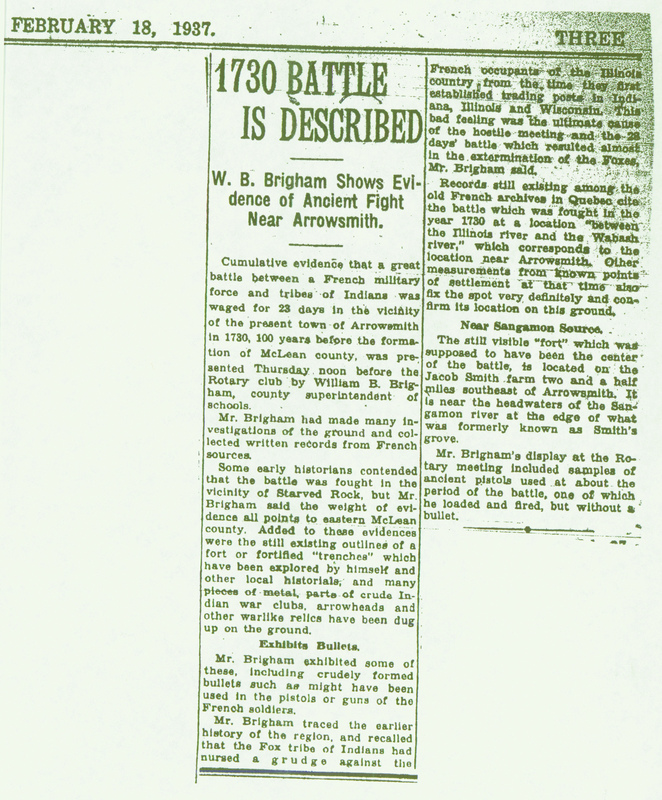 In 1937 Brigham convinced the McLean County Historical Society to place a marker at the Arrowsmith site, commemorating the siege of the Foxes.A boulder with the inscription “ETNATAEK: Here French and Indian Allies Defeated Fox Tribe 1730”. Etnataek, according to Brigham, was the Algonquin word for “where the fight, battle or clubbing took place.”Brigham cited of the Handbook of the American Indian Bulletin 30 Part 1 as the source of the definition.The term Etnataek is no longer used by modern historians and archaeologist to describe the site. In 1934 Brigham and several local students conducted an amateur archaeological excavation of the Fox fort.They found many artifacts which confirmed that a battle had been there.The artifacts included an ax head, lead musket balls, gun barrels, trigger plates, brass scraps, and bones among many others.These artifacts are all located in the object collection at the Museum. In the late 1980s and early 1990s archaeologists from Parkland College, led by Lenville Stelle, conducted a multi-year study and excavation of the Fox fort site.These excavations found more evidence of the Fox siege including Fox and French artifacts.Copies of these reports are located in the Museum’s archives.The excavations confirmed the work done by Brigham and other scholars and definitively place the location of the Fox siege in McLean County. 1880- "Where is Etnataek- Remarkable Ruins in McLean County"
1901- "Relics of Old Battlefield"
1937- "1730 Battle is Described"
1937- "Will describe early battle"
1937- "Fix Arrowsmith Area as Site of Indian Battle"
1947- "Archaeological Meeting Big Success"
1951- "French-Indian Fight Site to be Marked Fox Fort Site"
Behm, Jeffery A. "The Meskwaki in Easter Wisconsin: Ethnohistory and Archaeology." Wisconsin Archaeologist 89.1&2 (2008): 7-85. Salisbury, Jacquie. Mesquakie: The Sauk and Fox Indians of Illinois. Moline, IL: Illinois Writers' Guild, 1987. Stelle, Lenville J. "HISTORY AND ARCHAEOLOGY:NEW EVIDENCE OF THE 1730 MESQUAKIE (RENARD, FOX) FORT." The 1730 Mesquakie (Renard, Fox) Fort. Edmunds, R. David, and Joseph L. Peyser. The Fox Wars: The Mesquakie Challenge to New France. Norman: University of Oklahoma, 1993.